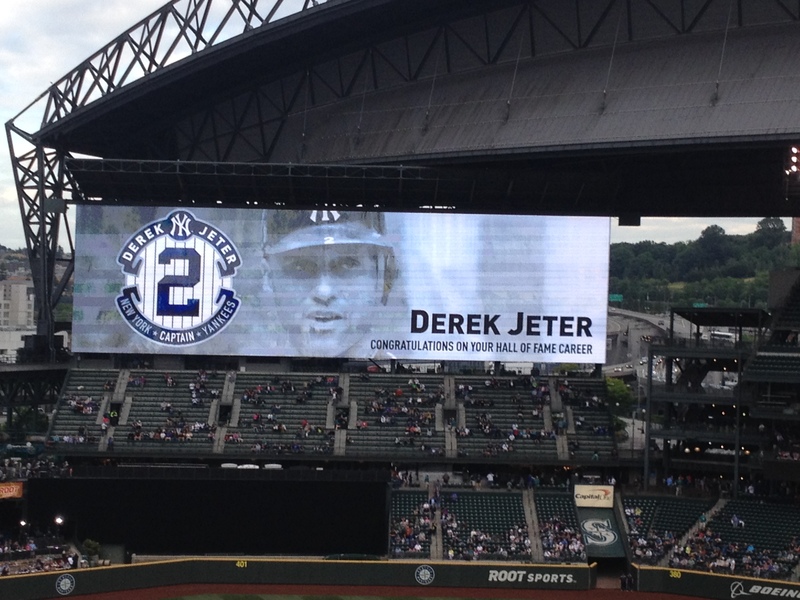 Jay and Edgar were on, before the game, along with Robbie and Felix to bestore Derek w/gifts . 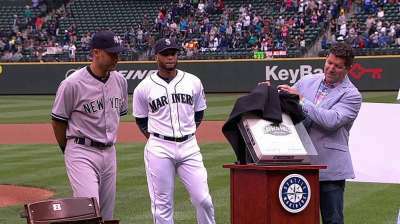 . .
Jay presented Jeter with a seat from the Kingdome (the venue where Jeter colleted his first MLB hit) Edgar presented the 2B bag from the game (it would be framed for Jeter after the series), Robbie gave him an inscribed watch (Rolex, no doubt) and finally, Felix presented him with a check to his Turn 2 foundation. Kuma had an un Kuma-like start to his start . . . In any case a very respectable start, The Bear definitely kept ’em in it . . . Some VERY hard hit balls were deftly run down and/or caught at the wall . . .
THREE DP’s tonight . . .
Mariners have signed their #2 pick Gareth Morgan. He will take bp on the field today. This entry was posted in GameDay, HOME and tagged attended, Buhner, Cano, Edgar, Furbush, Iwakuma, Jeter, NYY. Bookmark the permalink. ← g63 | follow the yellow-brick road . . .